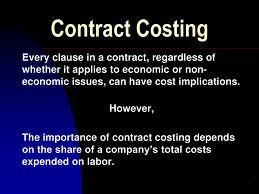 Contract costing is the tracking of costs associated with a specific contract with acustomer. For example, a company bids for a large construction project with a prospective customer, and the two parties agree in a contract for a certain type of reimbursement to the company. Fixed fee. The company is paid a fixed total amount for completing the project, possibly including progress payments. Under this arrangement, the company will want to engage in contract costing to compile all of the costs relevant to the construction project, just to see if the company earned a profit on the deal. Cost plus. The company is reimbursed for the costs it incurred, plus a percentage profit or fixed profit. Under this arrangement, the company will be forced under the terms of the contract to track the costs related to the project, so that it can apply to the customer for reimbursement. Depending on the size of the project, the customer may send an auditor to examine the company’s contract costs, and may disallow some of them. Time and materials. This approach is similar to the cost plus arrangement, except that the company builds a profit into its billings, rather than being awarded a specific profit. Again, the company must track all contract costs carefully, since the customer may review them in some detail. Contract costing can involve a considerable amount of overhead allocation work. Customer contracts typically specify exactly which overhead costs can be allocated to their projects, and this calculation may vary by contract. In some industries, such as government contracting and commercial construction, contract costing is the primary task of the accounting department, or may even be organized as an entirely separate department. Proper contract costing can contribute a considerable amount of profits, and so is typically staffed with more experienced contract managers and accountants.